William J. Mitchell* began by stating that the subject he is about to present is of importance for the future of cities throughout the world. He added that although the experiences he will draw upon concentrate on how developments in digital communications are affecting cities in North America and Western Europe, these experiences are definitely of relevance to cities belonging to different geographic, economic, and cultural environments, as is the case with Amman. He added that the lecture is based on three books he has written. The first of these is E-Topia (Cambridge, Mass. : The MIT Press, 1999), the book from which part of the title for the lecture is taken, and which deals with the topic of digital communications and cities. The second is City of Bits (Cambridge, Mass. : The MIT Press, 1994), a book he wrote at the beginning of the Internet and World Wide Web era, and which constitutes an early study of the relationship of these technologies to the evolution of the city. The third book, High Technology and Low-Income Communities, with Donald A. Schon and Bish Sanyal; (Cambridge, Mass. : MIT Press, 1999) deals with the effects of telecommunications technology on low-income communities, and specifically with issues such as social equity and economic development. This third book addresses both the developing world and economically marginalized communities in an advanced country such as the United States. Mitchell indicated that to better understand the effects of digital communications on the city, a few general remarks should first be made about the historical evolution of cities. Here, he states that human settlements historically developed at points of opportunity. They therefore emerged at locations featuring scarce and desirable resources such as water and access to transportation routes. As such settlements developed and grew in size, the interaction among their inhabitants increasingly became the glue that held the settlements together. Consequently, new economic, social, and cultural opportunities developed in these settlements, and these opportunities - rather than merely the physical and geographic characteristics that initially allowed a specific settlement to emerge - became the new engine that powered the growth and development of these settlements. Also, such settlements developed infrastructure networks that were absolutely crucial for allowing them to grow in size and complexity. The better-known examples of such infrastructure networks, which distribute resources and opportunities throughout the settlement, include water supply, waste disposal, sanitation, electrical power, and transportation systems. The importance of infrastructure networks emerged early on in the history of human settlements. Ancient Rome provides one of the more famous and beautiful examples of how such networks functioned about two thousand years ago. The city had a complex street network underneath which were located highly sophisticated water supply and sewage systems. Mitchell added that throughout history, we have seen the introduction of new kinds of infrastructure networks into human settlements. This is especially evident in the nineteenth and twentieth centuries, when we have seen the introduction of new transportation methods as well as electric power and telephone networks. Such new developments not only have allowed settlements to grow further, but also have allowed for additional diversity and complexity in the lives of their inhabitants. They have redistributed resources and opportunities, and have allowed many cities to function in different ways. This means that the locations and organization of activities in the city begin to change. Such a process of development is one that Mitchell identified as fragmentation and recombination. As new networks are introduced, established building types and urban patterns that had been based on preexisting infrastructure networks begin to fragment and to recombine. To illustrate this point, Mitchell provided a number of examples. The first is the introduction of piped water into a traditional village, a process that has been taking place throughout the world over the past century or so. Before the introduction of piped water, the inhabitants of traditional villages usually obtained their water from the village well. The village well centralized certain functions. For example, it was a meeting place for the exchange of news and gossip, or for getting to know people. In other words, it served as an important center for the types of social interaction typical of a traditional settlement. Once piped water is introduced to a village, the village well looses it significance. Functions of getting access to water become decentralized and move to the private realm, and houses begin to be fitted with private bathrooms and kitchens. As a result, the traditional pattern of social interaction in the village is transformed. The spaces where functions connected to water took place fragment and recombine. In this case, such spaces are no longer public and centralized, but become private and are distributed throughout the fabric of the settlement. A similar process took place in the United States, where electrical power networks were introduced in the nineteenth and twentieth centuries. The effects of this development were very clearly felt in places such as the industrial mill towns of the northeastern United States. Such towns, which marked the initiation of the industrial revolution for the United States, were clustered around sites of water and steam power since it was not possible to distribute power effectively very far from its source. As a result, one is presented with highly concentrated industrial communities in that region. However, with the introduction of electrical grids that allowed for the development of electrical distribution systems and small electric motors that could be located anywhere, the situation changed radically. It was now possible to power machinery just about anywhere, and industrial functions began to be distributed much more widely. Such functions no longer needed to be located at the point of supply of power, and new patterns of distribution of work related to industrial production began to emerge. A third example that Mitchell presented is the development of telephone networks and of new transportation systems during the twentieth century in many American and Western European cities. The telephone allowed the separation of management from the production site. Managers no longer needed to be continuously present at the factory and management moved downtown to high-rise office buildings in central business districts. This way, they could be close to other managers, which is where they wanted to be. As for modern transportation systems that depended on means of transport such as the automobile, commuter rail, and the metro, they allowed residences to be located away from places of work. These various developments have meant that the city became organized into industrial zones, residential suburbs, and the downtown central business district, and these different components were connected through modern transportation and telephone systems. Consequently, the industrial city developed a structure that is very different from that of the pre-industrial city, and once again, we are presented with a process of fragmentation and recombination that has resulted into the urban fabrics characteristic of the industrial city. Mitchell suggested that telecommunications networks are the latest of the infrastructure networks to affect the fabric of the city. They will change the way that our cities work, and will present both interesting problems and opportunities to the evolution of the city. As with the previously mentioned networks, telecommunications networks will transform the character and distribution of urban activities. These new networks present interesting and difficult consequences for the distribution of opportunities and access to services. They privilege people and places with access, and they can marginalize people and places without access. They create winners and losers and raise important questions relating to social equity. Such questions are of extreme importance to architects, urban designers, public policy makers, and responsible citizens in general. Mitchell stated that before attempting to address such questions, one needs to explore the character of telecommunications networks. To begin with, such networks operate at a variety of scales. There is the global scale, which is realized through satellite networks and fiber optic links that connect the world together. A second level is that of the city and the region, where residences and businesses are electronically linked. The third level exists within buildings themselves. Here, we see that buildings are becoming wired in denser and more sophisticated manners. This is evident in a variety of features such as computer networks. In fact, it can be said that such networks provide buildings with "electronic nervous systems." From those different levels one can further move down to the scale of the automobile. Most new automobiles are full of interconnected electronic components, and consequently can be viewed as a computer network on wheels. Beyond the level of the automobile, we have the scale of the human body. Increasingly, we are carrying electronic components on our bodies. These include personal electronic organizers, laptop computers, digital watches, digital cameras, and mobile phones, and more such items will be coming our way. In fact, considerable research is currently going on at MIT and at other places in the field that is being referred to as "body-nets," which refers to a most intimate kind of network where a variety of wearable and even implanted small electronic components are networked together. Consequently, we have a hierarchy of different networks: the body, vehicle, building, city, and global scale networks. All of these are beginning to interconnect, and a complete "electronic nervous system" is evolving as a result of this development. Mitchell cited as an example of large-scale national and international global scale networks a high-speed satellite earth station in Chandigarh, India. Chandigarh is the capital of the state of Punjab and the city designed by the famous French architect Le Corbusier. This satellite earth station, which is one of a series of stations that the Indian government has placed throughout India, links the area of the country in which it is located with international telecommunications networks. These stations have created nodes of economic opportunity since they have allowed software development industries to develop around them and thus have contributed to making India the world's second largest producer of software. These electronic oases greatly increase the flow of information in and out of the area in which they are located. On the city scale, enormous investments are being made all over the world in new building to building and neighborhood to neighborhood networks. For example, it is now a common site in a city such as Boston to see local telecommunications company workers placing fiber optic cables throughout the city. In this context, Mitchell cites a very interesting example from Singapore that shows how interesting relationships are developing between electronics in automobiles and city-scale electronic networks. In Singapore, drivers are required to place a little electronic device on their dashboard (figure 1). This device displays the amount of money that the driver has installed in a debit card that is placed in the device. At the same time, a number of streets in the city have electronic signs with pricing devices connected to them (figure 2). The signs display how much it would cost to drive along a particular street at a particular time, with the prices being differentiated according to the vehicle one is driving. Consequently, a large truck would be charged differently than a small automobile. Also, one would be charged a much smaller amount for driving down a certain road in the middle of the night than at peak hours. The manner in which this electronic network works is that when a driver passes through these streets, he or she would pass under wireless radio censors (figure 3) that sense the passing vehicle and charge the debit card placed in the small device that is located on the vehicle's dashboard. Figure 1: An electronic toll-road charging device placed on dashboards of motor vehicles in Singapore. Figure 2: Signs displaying charges for driving through a specific street in Singapore. Figure 3: Signs with electronic censors above a street in Singapore. The charges calculated by the censors are registered on the devices placed on the dashboards of motor vehicles. On the face of it, such a system may not seem desirable. However, Mitchell added that a deeper examination of it reveals that it in fact offers numerous positive features. Such a system relates taxation to the actual use of the road network. Therefore, one is charged when using the road and is not charged for not using it. Also, such a system provides a sophisticated method for demand management, which in this case relates to traffic. It discourages the use of busy streets at peak hours, and encourages drivers to use alternate routes at such times. For our purposes, such an example shows one kind of network communicating with another one. The automobile provides a small-scale network that is connected to a larger city-scale one. From there Mitchell moved on to the building scale and the domestic scale. Here he showed a drawing from the 1870s that was featured in the English humor magazine Punch (figure 4). The drawing, which appeared soon after the deployment of the telegraph, illustrates what is not too different from what we today refer to as video conferencing. The drawing imagines how families could be connected in a new way through video conferencing, and also presents how such an activity could be integrated into existing architectural spaces. The result is a space that is partially architectural and partially electronic. Figure 4: A futuristic drawing from the 1870s printed in the humor magazine Punchthat shows a mother and father in England carrying out the equivalent of a video conference with members of their family in Sri Lanka. Not surprisingly for a Victorian era drawing, the screen fits on the mantelpiece above the fireplace. The mother and father are in England, and members of their family are supposedly in Sri Lanka, which was part of the British colonial empire at that time. The children and the parents are talking, interacting, and carrying on a conversation as if they were in the same place, even though they are supposed to be thousands of miles apart. What has been imagined in this nineteenth-century drawing is the compression of space. In other words, two distant spaces are electronically glued together, thus providing a new kind of opportunity for human interaction that is based on electronic connections rather than on physical adjacency. The Punch illustration was ahead of its time, but the technology for realizing the idea it presents exists today. Another equally amusing, but more recent, example is one that IBM introduced several years ago under the name of Tele-Dine. 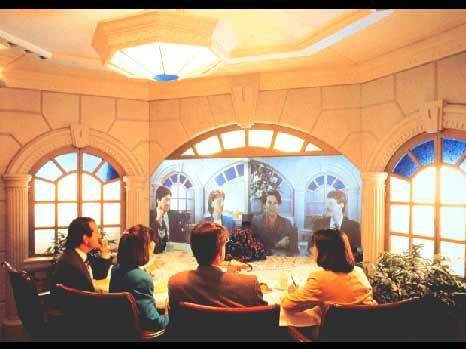 (Figure 5) shows a hotel meeting room that basically is sliced in half by a big screen. One half of the room is the physical space (for those who are located in it), and the other is the virtual space. In each space we have a semi-circular table with people sitting along one side of it, and a big screen divides the two halves. The figures in the other half of the image are located in another physical space that could be hundreds or thousands of miles away from the first one. Both groups are having a lunch meeting together. Here again, we see the use of electronics to glue distant spaces together. This arrangement works reasonably well, but does have some problems. For example, the video camera is placed in the flower arrangement shown in the image, so there is no way of establishing direct eye contact between the people in each of the two spaces. However, this is a minor technological problem that can be addressed easily. Figure 5: An illustration of the concept of Tele-Dine that was developed by IBM. An even more recent exploration of the integration of architectural space and electronic space is a 1999 exhibit at the Museum of Modern Art in New York. The exhibit, which was given the name The Un-private House, is the work of a number of young architects who have speculated about the nature of the house in the 21st century. Here, one architect imagined a kitchen configuration that has display screens connected to the Internet and located behind the kitchen counter (figure 6). Accordingly, the inhabitant of this house would have a virtual chef who helps with the preparation of food and gives advise on how to do it. Figure 6: A kitchen with a display screen connected to the Internet as featured in The Un-private House, an exhibition organized by the Museum of Modern Art in New York in 1999. Mitchell emphasized that these examples aim at showing that wiring up houses and buildings electronically involves much more than simply placing personal computers on desks. A great deal is taking place in this area of technological development and we are going to see much more in terms of electronic networks being integrated into architecture. Concerning what this infrastructure of electronic networks means for cities, and how is it going to change them, Mitchell set about answering these questions by pointing out a number of "myths" that have developed around this subject. He points out that although these myths do have an element of truth in them, they also tend to greatly oversimplify the reality of things. The first of these myths is that of universal decentralization. According to this myth, if you have a sophisticated electronic network, you can basically accomplish anything from anywhere. Consequently, one begins to imagine the decentralization of various human activities all over the place, thus making the traditional city superfluous, and resulting in its dissolution. The second myth is that of universal centralization, which is the exact opposite of the first myth. According to this view, if it is possible to electronically wire up the world and to run anything from anywhere, then we will see the centralization of power and economic capabilities in a few major central points in the world. The third myth is that the digital telecommunications technologies will completely substitute older technologies. For example, virtual spaces will replace many physical architectural spaces. Concerning the myth of universal decentralization, it began to evolve during the 1960s, when new telecommunication systems began to be developed. Therefore, people such as Marshal Mcluhan - considered by many to be the prophet of the electronic era - reiterated his belief that the city will become obsolete and will only exist as a cultural ghost for tourists. On a similar note, the urban theorist Melvin Webber, who wrote a number of highly influential publications on cities, also felt that the city will be losing much of its significance. He wrote that "[f]or the first time in history, it might be possible to locate on a mountain top and maintain intimate, real-time and realistic contact with business or other associates. All persons tapped into the global communications net would have ties approximating those used today in a given metropolitan region." As for the myth of universal centralization, it is true that it is now technically possible to control just about anything from anywhere. We also do have what can be referred to as a "winner takes all economy" developing in today's world. If a certain company is the first in innovating a new technologically related idea, it can dominate the market, and this is a strategy that large computer and Internet-related companies such as Amazon.com are pursuing vigorously. Moreover, it is true that we are witnessing the increased concentration of very powerful elites who are supporting their activities electronically in global centers such as New York and London. In addition, we see the increasing concentration of telecommunications related activities in important technological centers such as Silicon Valley, Boston, and Seattle. All of this does make people worry about the possibilities of increased centralization. The third myth, which states that virtual places might replace brick and mortar, and that telecommunications might substitute for transportation, also has some evidence to support it. We have seen the development of virtual libraries and bookstores. We have also seen in the United States a great deal of enthusiasm for the idea of telecommuting as a substitute for the daily commute. Whenever the price of oil goes up and the cost of commuting back and forth between places of residence and places of work increases, the idea of working in the home and connecting electronically between places of work and of living gains more support. However, it is interesting to note that statistics indicate that there is a correlation between the growth in the use of the Internet and the growth in air travel. Obviously we do not have the former developing as a substitute for the latter, as many had expected. However, we do have a few examples supporting such expectation. Here, Mitchell presented the example of the London International Financial Futures Market. As is the case with many traditional trading floors, it was a place where numerous traders actively and noisily ran around selling and buying. Now, such financial exchanges can be carried out electronically, and this is exactly what has happened in the case of the London International Financial Futures Market. Consequently, the space for the market is no longer needed and the building has been shut down. However, a more sophisticated view can be developed out of these various observations, and one can develop new ways of thinking about the spatial effects of new telecommunications technologies on the built environment. Basically what happens when you introduce new telecommunications technologies is that some traditional locational bonds are broken. For example, if you buy a book on-line from an on-line bookstore, you no longer have to come face to face with the bookseller, and you no longer have to be physically close to a bookstore to purchase a book. Therefore, the locational bond - the requirement of physical adjacency between those activities - breaks down. However, other locational bonds will always be needed for many functions. For example, it would be awfully difficult to get a haircut on line. Other experiences such as going to a restaurant cannot be displaced by developments in telecommunications technologies. After all, the whole point of going to a restaurant is experiencing a particular place and its particular ambience. One already can order fast food over the Internet, but this will not replace the experience of going to a restaurant. Therefore, some locational bonds are being broken, but others will remain. Moreover, other locational bonds will begin to take effect. Once again, we see a process of fragmentation and recombination of familiar building types and urban patterns. The process is very much like a chemical reaction in that it produces a new compound with new structures and properties. Here some bonds get broken, new bonds form, and a recombination of the atoms takes place. In order to fully understand this process of fragmentation and recombination, one needs to look at the driving factors that begin to effect the location of activities when traditional locational constraints are released by developments stemming from the introduction of telecommunications networks. Some activities begin to decentralize and reach wider markets. In fact, on-line retail is an attempt that aims at realizing such an objective. Other activities begin to centralize to achieve economies of scale. Yet other activities form new desirable alliances. For example, those who can work and live anywhere as a result of electronic connections might relocate to and live in recreational and scenic sites. Other activities begin to float freely to respond flexibly to dynamic conditions, particularly dynamic market conditions. Much is happening, and it remains too early and difficult to draw generalizations. To further explain these developments, Mitchell discussed the effects of electronic telecommunications on retailing. He cited the emergence of on-line booksellers such as Amazon.com and how they differ from traditional ones. The traditional bookstore packs several functions in a small space. It is a place in which books are placed, and one can browse through the store, examine the books, and select the ones he or she wishes to buy. When buying a book one executes a face to face transaction at the front of the store. Of course, there are also back-office functions such as keeping accounts that literally take place at the back of the store, behind the store's public space. In the case of an on-line bookseller such as Amazon.com, the functions of browsing and purchasing of books are virtualized and decentralized. Instead of walking among the book stacks to find a book that might be interesting to the reader, one logs in from a personal computer anywhere in the world with an Internet connection and searches through the on-line bookseller's virtual catalogue. Once one has selected a book, one executes an on-line electronic credit card transaction. The book is then delivered by mail to the buyer. However, as a process of decentralization affects such functions, other functions such as storage and distribution are radically centralized. Amazon.com in fact has gigantic warehouses and distribution centers at national airline hubs. Therefore, instead of having a relatively small number of books stored in numerous bookstores, the storage of books is now heavily centralized. At the same time, the process of maintaining accounts and wholesale ordering no longer needs to be carried out in the bookstore, near the books and the customers, but can be carried out from anywhere in the world where appropriately skilled labor is available at an attractive price. Therefore, some aspects of the traditional bookstore are heavily decentralized and others float dynamically and freely to different locations. Another example comes from the world of banking, where very dramatic developments have taken place, especially in the United States and Western Europe. We have seen a number of large banks shutting down branches serving local communities in large numbers, literally in the hundreds. In fact, about one third of existing branch banks in the United Kingdom have been shut down since 1985. All of the functions of the bank were accommodated in these traditional branch banks. You had to go to them to draw money or deposit it, as well as to carry out other functions such as negotiating loans. All of these activities were carried out face to face, during banking hours. However, what has happened to change this state of affairs has been the advent of the automated teller machine (ATM). These have enabled one to conduct banking transactions at any time of day or night, and from locations that are not necessarily adjacent to the bank itself. Consequently, the space of the branch bank has fragmented and recombined with other building types. ATMs can now be found just about anywhere where people might want access to cash, in places such as supermarkets, airports, and even gambling casinos. More recently, an even more dramatic development is that of home banking, where one can connect from anywhere in the world through a personal computer to conduct a transaction. All this further develops the virtualization and decentralization of bank-customer interactions. Therefore, we are reaching a situation - certainly in the United States and Western Europe - where traditional branch banks are completely disappearing. Instead, banking organizations are developing banks that can be referred to as electronic fronts. The main street façade is replaced by a screen logo on an ATM machine or a web site. As a result, there is a loss of the physical presence of the bank in local communities. As for back-office work, which is very extensive in banks, that too chases inexpensive, adequately skilled labor wherever it might be. In fact, a lot of the back-office work for American banks is carried out in places such as the Bahamas. Concerning the workplace, the question arises as to how will the development of tele-work - that of people working remotely via computer connections - affect the traditional office building. If one examines the typical office building, it is noticed that such buildings concentrate resources within their walls. They provide private workspaces in offices and cubicles, and they provide spaces such as conference rooms where people can meet together. However, the most important role of offices is that they are places where office workers are brought face to face with files and other kinds of information that is located on paper. Because so much important information that is needed to perform various functions is contained on paper, one had to do his or her work there. One had to come face to face with the material on paper. But this is changing. To see an example of this, one can look at the virtual office environments that have been used at MIT. For example, students there now have an environment in which there is a personal computer that is hooked up to the Internet and that enables them to gain remote access to digital files that are stored on a server, most probably at a distant location. These students no longer need to come face to face with information on paper to get their work done. They also are provided with audio and video connections to remote colleagues and therefore can discuss and exchange ideas about work with them (figure 7). Such technologies essentially create a virtual conference room that exists in cyberspace rather than in a physical space, and allow for the decentralization of private work. Office work that might once have been done in an office in a high-rise office building, can now take place just about anywhere such as the home or the hotel room. Files necessary to get certain work done would be available on the Internet. Consequently, private workspaces are gradually disappearing and the office worker is presented with higher levels of flexibility in the location and character of the work environment. Figure 7: A computer screen image used by an MIT architecture student. The screen displays links to CAD and spreadsheet databases, and a video connection to a remote design collaborator. However, face to face meetings will remain crucial for many important interactions. Centrally located meeting spaces are still very much needed. Therefore the character of office buildings is changing in that there is less of a need for private workspaces where office workers are brought in face to face contact with information, but there remains a strong need for spaces that can accommodate social interaction that is related to work. Electronic telecommunications technologies are also opening up the possibility for the development of electronic delivery services of various kinds. This is part of what is fueling the tremendous "dot com" fever in the United States. "Dot com" companies are starting up and trying to provide services in a new way by relying heavily on the Internet. For example, we are starting to see a tremendous amount of interest in delivering educational services remotely by computer networks. We are also seeing significant growth in tele-medicine that makes access to various kinds of medical services available through computer networks. Of course, the electronic delivery of audio-visual entertainment (music, films, .. ) is something that has been going on for quite some time, but this too has been taking on new forms. For example, the distribution of recorded music is rapidly shifting to the Internet. In the case of education, Mitchell showed a recent image of a design studio at MIT, where architecture students present their work to a design jury. Most of the jury members are sitting in the same space, but one of them is participating in the jury via video conferencing (figure 8). The distant juror can see the students' work and can hear their remarks, and he can comment on their work as if he was physically present with them. Here we see a restructuring of the educational process, where not all of the components of that process need to take place in the same physical location. Figure 8: An MIT architectural design jury in which a remote juror (shown on the television screen) is participating through the aid of teleconferencing technologies. Mitchell also presented the example of a surgical procedure being carried out over the Internet (figure 9). Here, a surgeon would have a display connected to a medical imaging system, and would have a controller that controls a remote robot that actually carries out the surgery. Accordingly, the surgeon and the patient do not need to be in the same physical space when a surgery is carried out, but can be thousands of miles apart. Although this might be an extreme example, there are many kinds of medical services that can be very effectively delivered electronically. For example, in medical imaging, there is no need to have the interpreter of a medical image in the same room as the patient, and the dispensing of medical advise and medical monitoring certainly can be done remotely. Figure 9: A surgical procedure being carried out over the Internet. Concerning the level of the home and the neighborhood, Mitchell points out how a number of changes are already taking place. For example, in a place such as Singapore, it is becoming more and more common to order fast food through the Internet, rather than through the telephone. In high-rise residential blocks in Singapore, one also sees the introduction of electronically controlled lockers. These lockers, which are controlled by a password, provide secure delivery points where items can be placed when the resident is not at home. Also, we are beginning to see a recombination of the home and the work place. Much more office work is being carried out at the home, especially among people involved in information-related fields. Ironically, one result of this has been the reinvention of a number of well-known pre-industrial urban patterns, such as that of having the workplace on the ground floor and the living space on the upper floors of a given structure. All this is leading to new living patterns. With the recombination of the home and the work place, we are starting to see the reemergence of intense 24 hours live-work neighborhoods. We are also seeing the emergence of small-scale local environments with global connections in neighborhoods in cities such as New York and San Francisco. Concerning the effects of telecommunications technologies on public spaces, Mitchell gives the example of the racecourse in Hong Kong. The importance of the racecourse in Hong Kong is evident in the amount of space it occupies, even though land is extremely expensive there. The racecourse in Hong Kong is a place where people gamble, but it is also an important place for social interaction. It is a place where people exchange news and gossip and also a place where one would informally negotiate business deals. In some ways, it performs the role of the traditional village well. However, that is now changing. This is evident in the new on-line betting devices that have been introduced in Hong Kong. These small devices can be plugged into any telephone connection. One would follow the races on radio or television and would accordingly place a bet within seconds by using such a device. The account of the gambler is then automatically and electronically credited or debited according to his or her choice of winners or losers. As a result, the racecourse in Hong Kong is being transformed as a public space, and once again, we see how a centralized place-based activity now begins to become highly decentralized. As a result, the traditional social functions that took place in many public spaces are now beginning to be questioned. In the final result, we see the emergence of new patterns of public spaces. Architects and urban designers will need to think about both physical and virtual spaces, for each of them works in a different manner. The future of cities will involve the processes of fragmentation and recombination in relation to public spaces. This means the emergence of new building types and urban patterns, and also the disappearance of preexisting building types and urban patterns. Also, we will be presented with spaces that will accommodate many more functions than they used to. An example of this is found in the proliferation of mobile phones. For example, in theaters in New York, we see enormous signs beside the stage asking the theater patrons to switch their mobile phones when entering into the theatre. Obviously, we here have a conflict between different functions, and we need to develop spaces that can incorporate both traditional and electronically related activities. There is also a need to design systems that combine both physical and virtual places, as well as telecommunications and transportation connections. Architects and planners typically have thought about the relationship between physical spaces and transportation connections. Now they have to extend their thinking to also encompass virtual spaces and telecommunication connections. These challenges do present a number of very interesting opportunities for more sustainable urban development. They present opportunities for re-purposing existing urban fabrics by rewiring them and introducing software systems that transform their functions. The recombination of the home and the workspace opens up opportunities to create fine-grained urban structures and a renewed emphasis on the pedestrian scale. This can lead to the reconfiguration of some humane and much loved pre-industrial patterns in a post-industrial era. Towards the end of the presentation, Mitchell raised the question of what it takes to create a successful city in an electronically globalized world. Here, Mitchell believes that the answer is providing unique local advantages that are valued in a global market place. Being able to do so will depend very much on developing, attracting, and retaining a talented workforce. The most important economic resource in the 21st century is probably a talented workforce that can operate in this new environment. Such a workforce tends to be highly mobile. Successful cities will be the ones to attract and retain talent, and they will achieve that goal through providing high quality services as well as physical and cultural environments that make them places in which people want to be. Mitchell ended by presenting the ironic conclusion that the result of the digital communications revolution does not seem to be the decline of cities and the decentralization of everything everywhere. In fact, traditional urban values, the quality of the physical environment, the services, and the cultural environment that cities have to offer are all probably going to now become more important than ever. One of the questions that were raised after the presentation inquired if Mitchell would provide more specific information about the influences of the telecommunications revolution on cities throughout the world. Here Mitchell stated that there is no simple answer for such an inquiry. To begin with, we do not yet have a sufficiently clear and definitive understanding of how the city is shaping up in the telecommunications era. However, what is happening fundamentally is that a large restructuring of the city is taking place and this has the potential to create both winners and losers. Here, we have to think more carefully about how we can use this technology to increase opportunity and social equity, rather than to use it to increase the gap between the haves and the have nots. The technology can create results in both directions, and it is the social policies that will be implemented that will determine the effects of the technology on the inhabitants of the city. Therefore, the answer to the question lies in what we do with the technology, rather than in the technology itself. Another question inquired about the effects of such technologies on immigration from the developing to the developed world. Mitchell responded by saying that interesting research has been carried out on that subject. The digital revolution has created a number of highly skilled and highly mobile young professionals. They tend to move to where opportunities are available. Obviously, this is resulting in an unfortunate brain drain, where such young professionals from the third world are looking for opportunities in the more developed one. This has happened to a great deal in India. Also, interesting relationships are evolving between the new high-tech world and the traditional service sector, and these relationships are influencing immigration patterns. An example of this is found in the Borough of Manhattan, in New York City. Lower Manhattan is a global center of the financial services industry, and has a tremendous concentration of very sophisticated, powerful, and wealthy people who work in that sector. This concentration of people demands a tremendous amount of traditional service work. It creates great demand for janitorial services, dry cleaning, food preparation, ... etc. In other words, a tremendous demand has been created in Manhattan for relatively low-skilled migrant labor, and that labor is coming to meet that demand. Obviously, a number of complex effects are beginning to develop in relation to migration patterns that are effecting both high and low-skilled labor. Another question dealt with the nature of political power in cyberspace, and how it works. Here, Mitchell stated that political power traditionally has been related to geography and control of territory. The Internet and the digital telecommunications revolution have clearly done much to weaken the connection between political power and geography. Also, as it is known, nobody is in charge of the Internet, which depends on a large number of local networks that are interconnected by means of telecommunications protocols. In other words, the World Wide Web works from the bottom up. Even the local network administrator does not exert much control because in most cases there are alternatives to that administrator. Controlling the Internet is going to be a much more challenging task than the control of traditional communications networks of roads and sea routes. One will need to wait some time before more definite conclusions can be made, but Mitchell added that he strongly believes that the Internet will prove to be a tool of democratization. One of the questions dealt with the effects of the digital era on slum areas, on both the physical and social levels. Mitchell again emphasized the importance of public policies in this regard. These policies will greatly depend on the initiatives of governmental organizations and also of Non-Governmental Organizations (NGOs). Such policies need to be directed at achieving economic opportunity, social equality, and on making sure that some level of equity is achieved in providing access to telecommunications infrastructure networks. If that does not happen, we will be heading towards social disaster. Of course, what we are facing is not different from the introduction of new infrastructure systems in the past. When a piped water supply system is installed in a part of a city - but not to another part of the city - a situation of inequity is created. The difference is that in the case of telecommunications infrastructure networks the results of such differences are going to be felt at a tremendously quicker pace than in the past. Another question dealt with the future of universities in the digital era, and whether it will render them obsolete. Mitchell stated that these are questions that are being debated continuously at MIT. Some MIT faculty members have gone as far as saying that there is no need for the expensive real estate on which the MIT campus is located and that the institution can be run as a virtual community. However, Mitchell belongs to the opinion that takes the exact opposite view. Many have realized that what is unique about a community such as that represented in the MIT campus is that it provides enormous intensity of interaction among people of high intellectual capabilities. In fact, this is what MIT is actually "selling," and one of the main reasons why MIT attracts such a high caliber of faculty and students is that it provides them with the opportunity to interact with numerous people of a high intellectual caliber. Finding a similar concentration of such people would be difficult to achieve in ordinary communities. Consequently, the physical community of a place such as MIT is as important today as it ever has been. However, it is also now possible to share resources electronically with different communities of scholars. This way, each scholarly community would concentrate on what it does well, and each of these communities would exchange the results of its work with other scholarly communities. In the past, universities very much functioned as isolated economies, and tried to provide everything that supported their respective communities. They can now think more in terms of communities connected to other communities through the export and import of knowledge. However, Mitchell emphasized that he does not see the university campus disappearing as a result of these developments. In fact, it is probably going to become more important than ever. In this context, Mitchell pointed out that MIT is now engaged in the largest building program in its entire history, exactly during the digital era. Here, Mitchell added that the ArchNet project that MIT is developing with support from the Aga Khan Trust for Culture is very much directed towards the sharing of resources among universities throughout the world. For example, every architectural school in the world has essentially the same slide library, and spends enormous time and resources developing such libraries. The ArchNet project is working on establishing a system in which each university would develop a slide library related to its own geographic location - which is what it can do best - and then the universities would share these different slide collections electronically. This way, all parties involved would greatly benefit. This sort of activity can be carried out effectively at long distances, and it is the revolution in telecommunications technologies that is making it possible. *William J. Mitchell is Professor of Architecture and Media Arts and Sciences, and Dean of the School of Architecture and Planning at MIT. He also serves as Architectural Adviser to the President of MIT. Before coming to MIT, he was the G. Ware and Edythe M. Travelstead Professor of Architecture and Director of the Master in Design Studies Program at the Harvard Graduate School of Design. He previously served as Head of the Architecture / Urban Design Program at UCLA's Graduate School of Architecture and Urban Planning, and he has also taught at Yale, Carnegie-Mellon, and Cambridge Universities. In the spring semester of 1999 he was visiting the University of Virginia as Thomas Jefferson Professor. He studied at the University of Melbourne, Yale University, and Cambridge. He is a Fellow of the Royal Australian Institute of Architects, a Fellow of the American Academy of Arts and Sciences, and a recipient of honorary doctorates from the University of Melbourne and the New Jersey Institute of Technology. In 1997 he was awarded the annual Appreciation Prize of the Architectural Institute of Japan for his "achievements in the development of architectural design theory in the information age as well as worldwide promotion of CAD education." Figure 4: A futuristic drawing from the 1870s printed in the humor magazine Punch that shows a mother and father in England carrying out the equivalent of a video conference with members of their family in Sri Lanka.